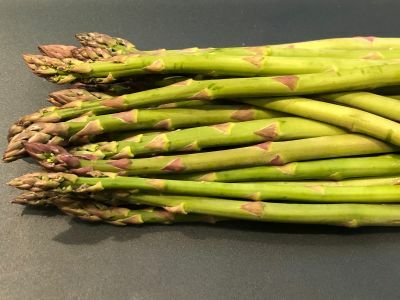 Once the asparagus starts hitting the farm stands, you know spring time has officially arrived. And it's time to take advantage of it because the asparagus season doesn't last anywhere near long enough. It is so tender you can eat it raw but here we blanch it and put it in an ice bath to maintain some of the crunch. Then we pair it with a tangy lemon vinaigrette to bring out all the best it has to offer. 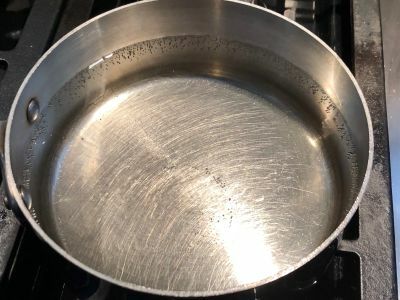 We suggest you undercook this as opposed to overcooking it which can make it limp and soggy like it seems so many people do. 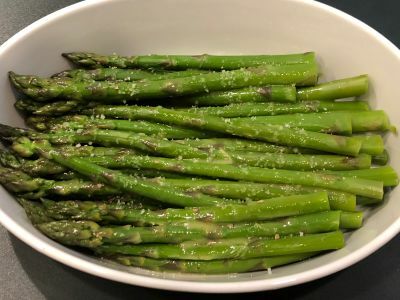 If you are lucky enough to get fresh asparagus, you don't need to cook them very long at all. Older asparagus is a different story. But give it a try and tell us how you like your asparagus. We want to know. Enjoy! 1. 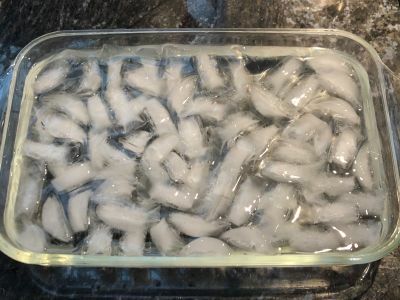 Prepare an ice bath large enough and deep enough to hold the asparagus flat and submerged in the ice water. 2. If you have some thin and some thicker spears of asparagus, separate them. Trim the ends off to the tender part of the asparagus. To do this, start by trimming off the bottom inch and then taking a small bite of the cut end of the piece you cut off. 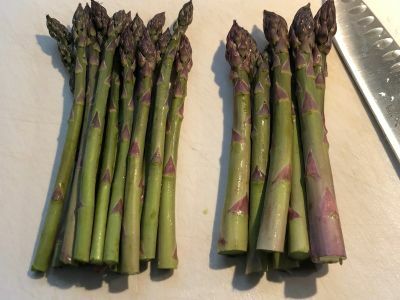 If it is stringy or woody or tough, cut another half inch and repeat until the asparagus is tender. 3. 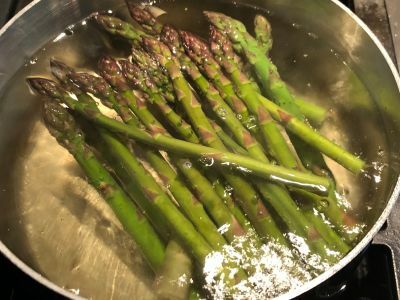 Bring a pan of water to a gentle boil and add the thicker stocks of asparagus. Cook for 1 to 1 1/2 minutes and then add the thinner stocks. Cook for another 1 to 1 1/2 minutes until they are cooked to your desired tenderness. Do not overcook them! If they are fresh, 1 minute and 1 minute should be enough. 4. 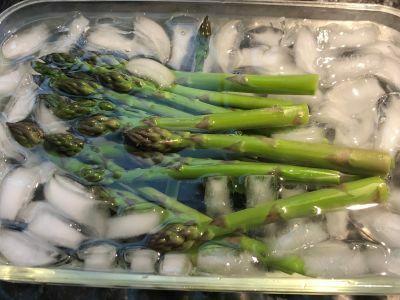 Remove the asparagus with a pair of tongs and add it to the ice bath. 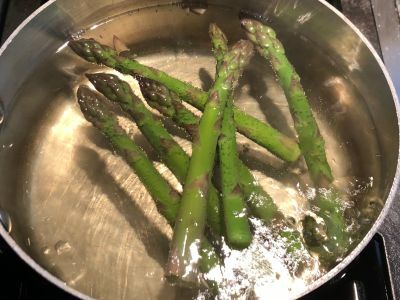 Using your hands, gently move the asparagus around until the water is cold. 5. 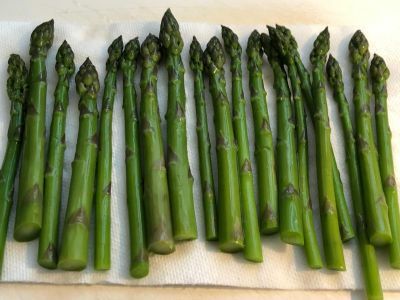 Remove the asparagus to a paper lined flat surface and gently move it around to dry the asparagus. 6. 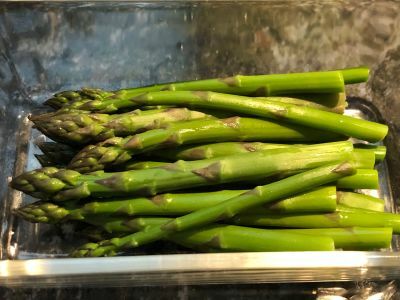 Transfer the asparagus to a container that is long enough to hold the asparagus and if you are not going to eat it right away, cover it partially and refrigerate it. 7. 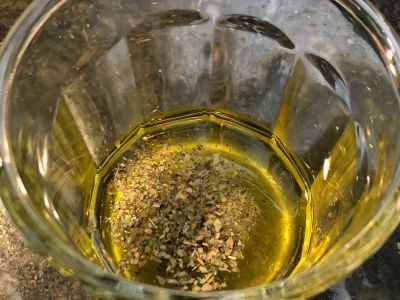 Add the lemon, olive oil, salt, pepper and oregano to a small bowl or container. Whisk the mixture until emulsified. 8. 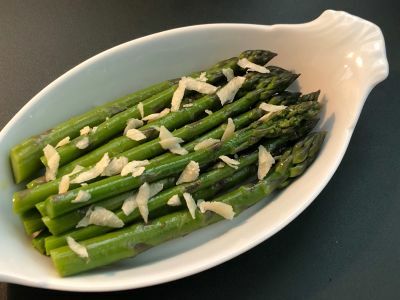 When you are ready to prepare the asparagus, drizzle the dressing over the top 1 tablespoon at a time and lightly toss the asparagus to coat it evenly. Your hands are the best tool for this, especially if you keep disposable food gloves handy. Do not overdress the asparagus. If you have some dressing left over, lucky you. 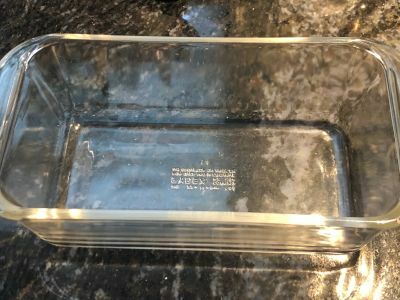 Use it on a salad or any vegetable you want to make it taste amazing! Serve at room temperature as a side vegetable or as an appetizer with a nice glass of wine. Enjoy! 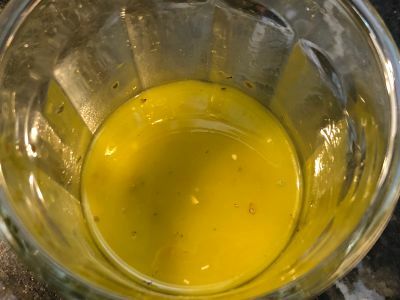 The standard vinaigrette mix is 1 part acid (in this case lemon juice) to 3 parts olive oil. We are using slightly more oil which will make this a little less lemony tasting which is what we want so we don't overpower the asparagus. If you want more lemon flavor, simply add a little bit more lemon juice or a little less olive oil until you get it to your desired taste.